Next to lettuce, tomatoes rank at the top of the American fresh vegetable preference list. Hardly a sandwich or salad gets served without the ubiquitous tomato slice. Most backyard gardens are tomato friendly for seed and seedling started plants. Purchasing tomato starter plants saves the average gardener about two weeks worth of germination time and effort. The large number of tomato varieties lend themselves to only a few general growing tips. Basically, tomatoes are warm weather, sun dependent plants that require proper water and nutrition to reach their fruiting stage. Most gardeners start their tomato selection process by choosing between either determinate or indeterminate tomato varieties. Determinate tomato varieties grow as small bushes. Indeterminate varieties are large vine plants that require a physical support system, such as a cage or trellis, to keep the vines secure and steady throughout their growth. Plant growth stops only after the first frost or, unfortunately when the plant succumbs to a fatal disease. Otherwise, it continues to flower and fruit almost indeterminately. Many of the popular slicing tomatoes like beefsteak are indeterminate vine tomatoes. Once the tomato variety is selected, plan on a two stage, indoor and outdoor, growing season. Depending on tomato variety, the indoor growing season takes anywhere from four to six weeks. It consists of prepping the plants for outdoor growth. Healthy young tomato plants thrive on consistent temperature, nutrient, water and lighting conditions. Tomato outdoor growing season starts with transplanting the tomatoes into their designated garden spot. Again, depending on variety, plants need an appropriate support system during stem and branch development. Flowering and fruiting behavior becomes noticeable approximately two weeks following their transition from indoor seedling to outdoor garden plant. Indeterminate varieties need a bit more attention after flowering. As the season progresses, moving the growing tomatoes to a place on the support structure allows for continued tomato growth. The total time from flowering to, fruiting and harvesting generally falls in a three to six week range. Managing all the vines during the flowering and fruiting season extends the harvesting season from summer through fall. Finally, extreme low or high temperatures tend to disrupt flowering in many tomato varieties. Plants often exhibit signs of stunted growth after flowering during atypical weather patterns. Along with pest infestations, poor weather conditions tend to shorten the growing season. 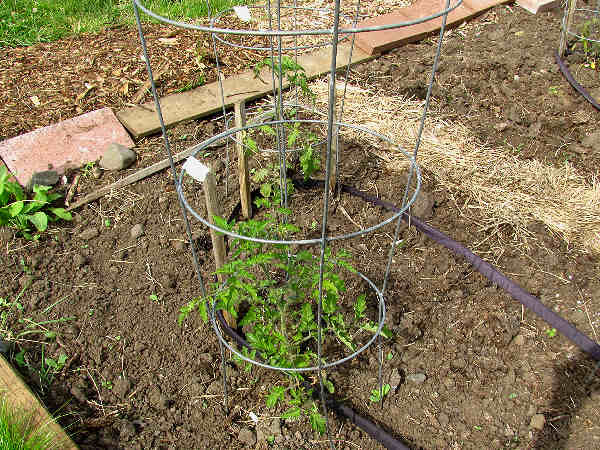 Managing tomato pests starts with basic preventive steps. Disease resistant tomato varieties sell well. Often the label on the seed pack will contain the letters letters V, F, N, T, or A to inform the consumer of the resistance types. Local garden store staff can also inform consumers of the disease resistance varieties built into their seedlings. Tomato pest management starts with clean soil. Maintaining a weed free environment throughout the outdoor growing season also contributes to healthy plant growth. During the growing season pest management tips are dependent on individual garden factors such as weather and climate. For example, tomatoes are the typical warm weather vegetable, however in instances of an extended heat wave (over 95oF), or over watering, the fruits can literally begin to crack. Experts also warn against planting tomatoes near a black walnut tree because the tree produces chemicals that can kill off tomato plants. 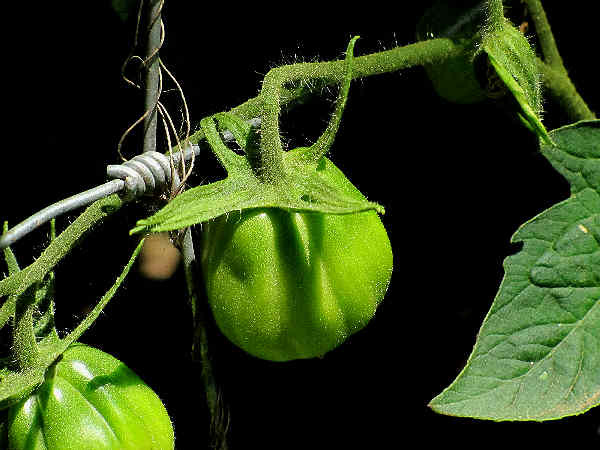 In the real world garden, tomato plants face many challenges. 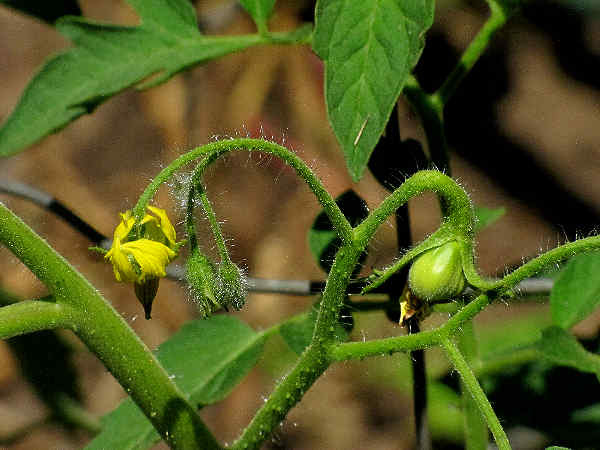 The following outline of common tomato fungus, viruses and insect pests provides a first step for potentially diagnosing the most common tomato problems confronting gardeners. Early Blight: Look for brown and black spots on mature leaves. Late Blight: Water soaked spots on leaves that turn them brown. Fusarium and Vericillium Wilt: Look for mature leaves turning yellow. Tobacco Mosaic Virus: Look for multicolored leaves, i.e., dark and light green and yellow leaves. Cucumber Mosaic Virus: Look for smaller, thin, yellow leaves. Tomato Spotted Wilt Virus: Look for dark spots on light green or yellowing leaves. Aphids: Look for a large group of very small insects along the stems. Flea Beetles: Look for small jumping insects around the leaves and ground. 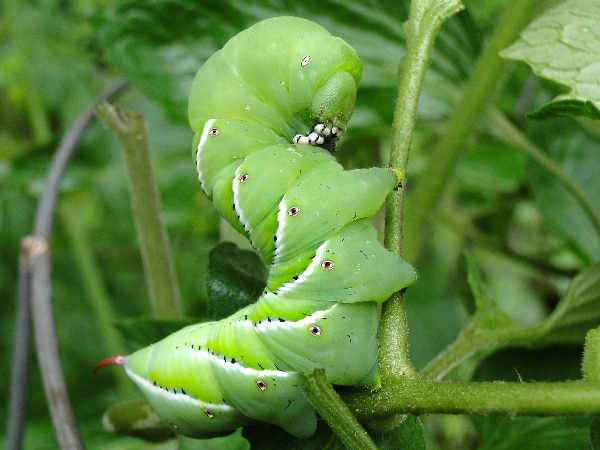 Hornworms: Look for caterpillars like the one pictured. The question of whether the tomato is a fruit or vegetable comes up in many everyday conversations at work, school and play. There is no easier answer than “it depends” on who you ask. Sometimes botanists use the terms fruit and vegetable to describe different parts of plants. Starting in grade school, children learn the botany short cut for this concept by describing fruits as foods with seeds. Sometimes botanists define vegetables in opposition to their definition of fruit. That is, vegetables refer to the other parts of the plant, including stems, stalks and roots. Under this definition, celery stalks and root vegetables such as carrots fall in the vegetable category. From this starting point, tomatoes are fruits, and so too are peas, string beans and all the other vegetables at the dinner table that contain seeds. Speaking of dinner tables, parents often tell their children to finish their vegetables. Often parents use the term vegetable more loosely with a meaning of, eat your peas and string beans. If parents were using a botanical context when they said finish your vegetables, it would mean, you do not have to finish your string beans and peas. Lawyer talk also changes the meaning of tomato. Here are three examples of tomatoes being defined three different ways. In 2003, for example, Tennessee declared the tomato the state fruit. In 1987, the people of Arkansas declared the South Arkansas Vine Ripe Pink Tomato as both the state fruit and vegetable. 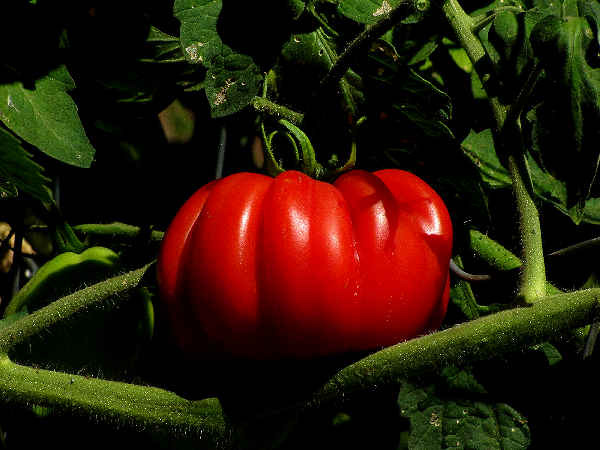 The people of New Jersey are considering designating the Jersey tomato as state vegetable. So, is a tomato a fruit or vegetable? With all that information, it is still tough to tell.